So we decided to take them to The Creperie in Ship street as a pancake always feels like a treat and we’d heard great things. We were greeted by Donna and made to feel welcome straight away, Donna told us they opened on Pancake Day just four weeks ago. They’d attempted a pancake stack world record challenge shortly after opening and were delighted with how busy they’ve been ever since. 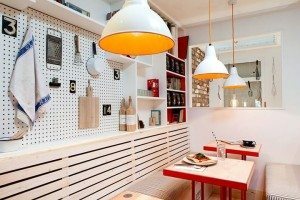 This is great news as I know lots of my friends are looking for breakfast, lunch and dinner alternatives, plus this is a great place to bring the big and little children. 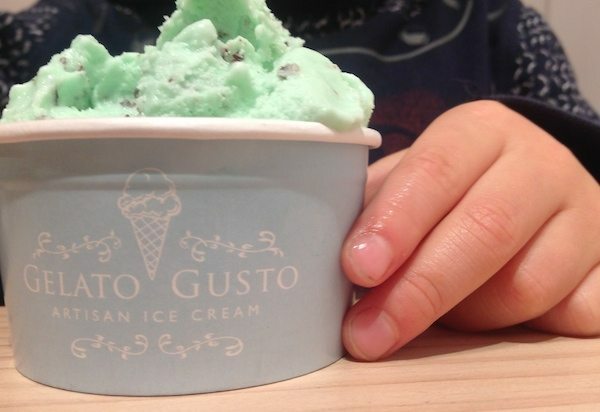 Here you can get sweet and savoury pancakes, Small Batch coffee, Gelato Gusto ice creams and much more. We arrived just before midday and the restaurant/ café was half full, along with those customers who were taking there Crepe’s out into the glorious sunshine. 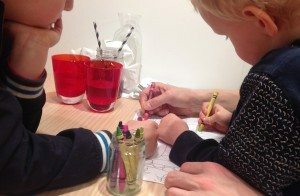 This was nice, as our two boys (4 and 5) could pick our table – so they ventured downstairs and found a nice one in the back corner. The boys loved going downstairs to choose and the restaurant was very accommodating with colouring for them to enjoy and the promise of a trip upstairs to look at the different ice creams for dessert on good behaviour. coloured chairs, beautiful napkins covered in their logo, with printed whisks of all shapes and sizes and we all agreed The Creperie had a great feel to it. There is a sofa at the far end if you fancy chilling with a breakfast pancake, a coffee and your papers – something Steve and I can only dream of these days. With our boys (who are quite vibrant shall we say), those lazy breakfasts are something of a distant memory and let’s just say we don’t require caffeine to give us a boost…Oh no, they ensure we feel on the edge most of the time! The menu has so much choice, from sweet pancakes to savoury, cold or hot wraps or salads. For those of you who might not like pancakes too, there are great alternatives with a varied choice of fillings. 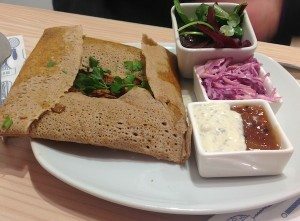 One thing we really liked is the fact that their Galettes (hot savoury pancakes) are gluten free and made from specialist buckwheat flour sourced from France. I have friends that have gluten allergies and I’m saving this place secret for their Birthday. Our little boys decide on Chicken Supreme, filled with chicken bacon and cheese, along with a cold ham and coleslaw wrap. For Steve; Donna recommended the ‘Sri Lankan’ -made with spices, onions, spiced chicken and a hint of coconut! Not the standard crepe filling but then again neither is Haddock in a cream cheese sauce – which I’m informed is also different yet delicious. I chose the Mushroom Medley but next time will have to try The Orient with confit of duck, hoisin, spring onions and cucumber. Hungry? Water was brought to the table when taking our order, this we thought was a nice touch. Also worth noting that with the soft drinks you can help yourself to unlimited refills and the prices for the food are all very affordable. The kids meal deal is £6.95, includes a crepe, waffle or wrap with unto two toppings, a scoop of gelato and unlimited drinks – bargain. We all ordered a soft drink although there is a selection of alcoholic beverages should you not need your wits about you! The boys soft drinks looked great and came in clear glass tankards with stripy straws – very retro looking. The place then started to fill and as our mains are brought to us there is just a couple of seats remaining and The Creperie was alive with happy people as though there had been some exodus from the beach. 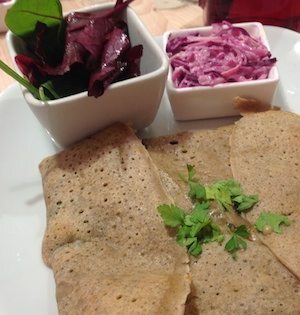 The Crepes we ordered, certainly put a smile on our faces – each meal served with a side of both fresh baby leaf and homemade red coleslaw – yum! My Mushroom Medley is warm with a combination of wild mushrooms, creme fraiche, white wine sauce, with dill and spinach leaves. 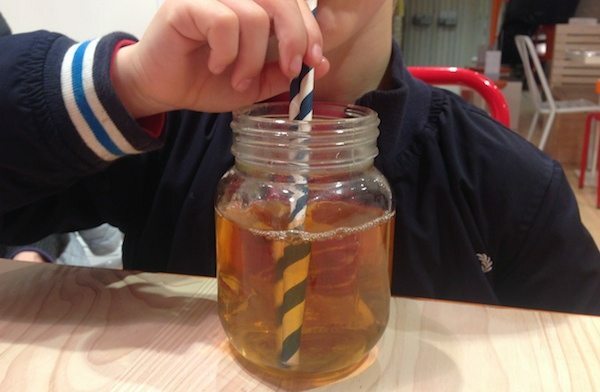 Very nice and delicate in flavour, my greedy 5 year old must of thought so too, especially as he kept taking mine. I can’t complain though as the mushroom and spinach was surely counting towards his much needed “five a day”. 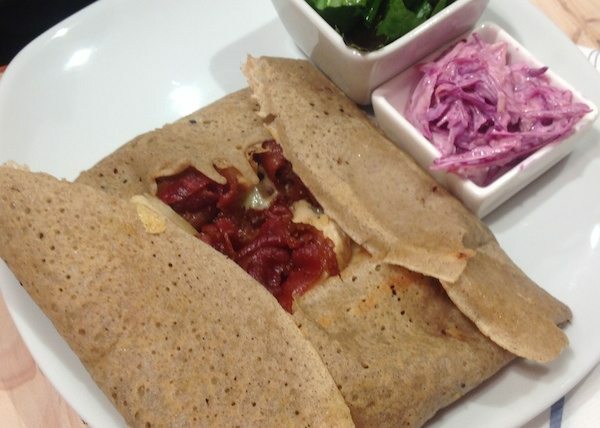 His pancake (Galette) was also very good; non greasy with well cooked chicken, very crispy bacon and melted cheddar – YUMMY. My youngest didn’t speak much, which I must say made a nice change and so he was clearly enjoying his cold wrap. Steve was very happy that Donna had recommended something a little different from what he would normally of chosen. The ‘Sri Lankan’ was also non greasy, very tasty, slightly spicy with a hint of coconut coming through – served with mango chutney and raita – a delicious combination and another we would have again. Although we were all pleasantly full – we felt it would be a little rude to go to a Creperie and leave without having a sweet one! 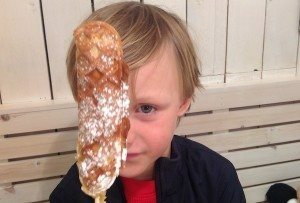 The boys chose a waffle on the stick, Steve and I decided to share a Black Forest and our four year old was already upstairs looking at the different coloured ice creams. The sweet treats were presented very well, all sprinkled with icing sugar. The boys maple syrup covered waffles were great, as the stick meant they could just pick up and dig in and the ice-cream was already gone. The Black Forest was delicious, filled with black cherries, melted chocolate and fresh whipped cream..MMM yes we’ll be having that again the next time we pass by. 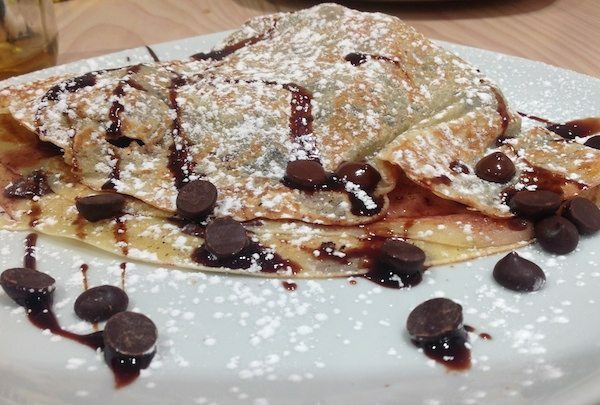 Yes, The Creperie is well worth a visit and with the summer on the horizon, this means there’ll be plenty of opportunity.